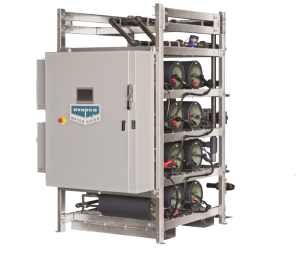 Michigan Air Products is pleased to introduce a revolutionary new water saving technology for evaporatively cooled systems – the EVAPCO Water Saver (EWS). The EWS utilizes capacitive deionization technology to remove unwanted ions in the make-up water, thereby allowing an increase in operating cycles of concentration to yield significant water savings. And by significant water savings, we mean it. A school added the EVAPCO Water Saver to an existing air conditioning system and sees a savings of 1.5 MILLION GALLONS PER YEAR. Read more about the EVAPCO Water Saver HERE.